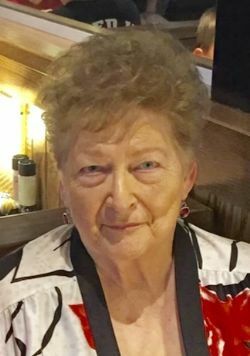 Norma Lugene Robertson, 89, of Greenville, died Sunday, February 10, 2019 in Hunt Regional Medical Center. Graveside services will be 11:00 AM, Wednesday, February 13, 2019 at Forest Park Cemetery with Dr. Frank Teat officiating. Visitation will be Wednesday, 10:00 AM until service time at Coker-Mathews Funeral Home. Mrs. Robertson was born in Lone Oak, Texas on September 27, 1929. She was the daughter of Melvin (Tate) Morrison and Beatrice Eva Morrow Morrison. She married Reagan E. Robertson, Jr. on April 22, 1949 in Greenville. She was of the Methodist faith and retired from Greenville Independent School District. Family, and her role as a mother and grandmother, was the most important thing to our Mother. Spending time with her family was what she enjoyed most of all. Mother was a one of a kind, feisty woman and a wonderful counselor to everyone. People were drawn to her for advice and she loved helping them. We will hold her in our hearts until we can hold her in Heaven. Survivors include her daughters, Debbie Williams and husband Ron of Greenville, Gina Steinberg of Emory and Dena Pollard of Greenville; grandchildren, Adam Williams, Zach Williams, Chris Nichol, Kelly Couch, Charlie Butler and Morgan Day; eleven great-grandchildren; and cousins, LaVern Adams and Doug Morrison. She was preceded in death by her husband, grandson, Dusty Williams and her parents. Pallbearers will be Adam Williams, Zach Williams, Chris Nichol, Charlie Butler, Lance Couch and Ron Williams.